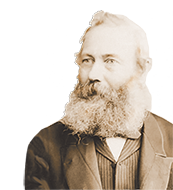 1825 James Shirley Hibberd (JSH) born in Mile End Old Town, now Stepney, east London, possibly son of a retired sea captain; born into a Nonconformist family. c.1839 JSH’s father dies and he receives no further education; is probably apprenticed to a bookbinder. c.1846 JSH experiments with opium and cannabis. 1848 JSH is a member of the Vegetarian Society, is lecturing in east London on their behalf and editing their magazine, the Vegetarian Advocate. He is described as an operative chemist. 1850 SH has now dropped James from his name and marries Sarah Elizabeth Voyer. They set up home in Clerkenwell, then Pentonville, where he starts a garden, despite difficulties. He works as a science lecturer and writes for a variety of magazines. 1855 Brambles and Bay Leaves, Essays on the Homely and the Beautiful, closely followed by The Town Garden, A Manual for the Management of City and Suburban Gardens, but soon ‘a dark cloud overspread my domestic life’, which was destined to affect Sarah and make her an invalid. 1856 Rustic Adornments for Homes of Taste, which describes aquariums, bee-keeping, bird-keeping and Wardian cases, as well as gardening. It is an immediate success and a new enlarged edition is published the following year. Three aquarium books are also published. 1857 SH moves to Lordship Terrace, Stoke Newington. 1858 The publishers Groombridge and Sons set up SH with a monthly a magazine, The Floral World and Garden Guide, which expands the topics in Rustic Adornments and is aimed at ‘amateurs with moderate means and ambitions to excel in the various practices of horticulture’. He uses an account of his Stoke Newington garden to teach his readers about setting up a new garden. 1859 New edition of The Town Garden continues the story of his own garden. 1860 SH president of the Stoke Newington Chrysanthemum Society. 1862 SH takes over the ailing Gardener’s Weekly Magazine. 1863 Profitable Gardening. 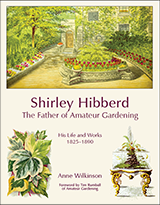 Engravings of the Stoke Newington garden start to appear in publications, and a portrait of SH himself is made available. 1864 The Rose Book. SH designs a new layout for Islington Green. 1865 – Gardener’s Weekly Magazine re-launched as the Gardener’s Magazine and becomes the best selling horticultural weekly. SH helps to found the London Society of Florists and Pomologists; and helps to start the Guildhall Flower Show. He also publishes criticism of the RHS and votes for the council to resign. 1866 William Robinson writes for the Floral World. Readers are asked to subscribe for a present for SH as appreciation for all his work. 1867 SH accuses an American publisher for using pages from Rustic Adornments for Homes of Taste without authority. 1868 New and Rare Beautiful-Leaved Plants. 1870 Field Flowers, A Handy Book for the Rambling Botanist. SH and Sarah leave Stoke Newington and start a new garden in Hermitage Road, Hornsey. New enlarged edition of Rustic Adornments. 1871 The Amateur’s Flower Garden. 1872 The Ivy; The Seaweed Collector. SH criticises William Robinson for using his lists of vegetables in The Garden. 1873 The Amateur’s Greenhouse and Conservatory. 1874 End of The Floral World. The Field (edited by William Robinson) publishes a criticism of The Ivy as ‘a waste of time and trouble’. 1877 The Amateur’s Kitchen Garden. 1878 Home Culture of the Watercress leads to SH being awarded a gold medal by the RHS. 1879 ‘Water for Nothing – Every House its own Water Supply’; Familiar Garden Flowers starts to be issued. 1880 SH and Sarah move to Brownswood Park, Highbury. Sarah dies of heart disease and is buried in Abney Park Cemetery. 1881 Feud between SH and William Robinson generated by SH’s criticism of WR’s asparagus competition. 1884 SH invited to edit Amateur Gardening, a new cheap paper, published by Collingridges. Marriage to Ellen Mantle, his cook. They move to Priory Road, Kew. SH works for the RHS on renovating their garden at Chiswick; is a member of the Floral Committee and the Garden Committee. 1885 Birth of SH’s daughter Ellen, and death of Ellen, his wife; she is buried in Abney Park. The Golden Gate and Silver Steps. SH organises a Pear Conference. 1886 Primula Conference; Liverpool Orchid Conference. 1887 SH leaves Amateur Gardening. 1889 Vegetable Conference; Chrysanthemum Conference. 1890 Strawberry Conference; second Chrysanthemum Conference. Death of SH and burial in Abney Park. Portrait commissioned by the RHS. Collingridges bring out new editions of most of his books.